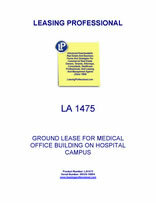 This Lease is made as of _________________, by and between MEDICAL PROPERTY LANDLORD, INC., a __________________ corporation ("Landlord"), and AGREEABLE MEDICAL TENANT, INC., a _________________ corporation ("Tenant"). 1.1 "Additional Rent" shall have the meaning provided in Section 3.2. 1.2 "Affiliate" means with respect to any specified Person, any other Person which, directly or indirectly, through one or more intermediaries, Controls or is Controlled by or is under common Control with such Person. 1.3 "Base Rent" shall have the meaning provided in Section 3.1. 1.4 "BOMA Standards" shall mean those standards adopted from time to time by the Building Owners and Managers Association International. 1.5 "Buildings" shall mean the office building(s), Equipment and other improvements and appurtenances of every kind and description now located on the Land, and any and all alterations and replacements thereof, additions thereto and substitutions therefor hereafter erected, constructed or placed on or about the Land. 1.6 "Business Day" shall mean any day, which is not a Saturday, Sunday, or a day observed as a holiday by either the State of ___________ or the United States government. 1.7 "Capital Improvement" shall have the meaning provided in Section 12.1. 1.8 "City" shall mean the city, village or town in which the Premises (hereinafter defined) are located. 1.9 "Claim" shall have the meaning provided in Section 26.1(a). 1.10 "Commencement Date" shall mean the date of commencement of the Term (hereinafter defined) as set forth in Article 2. 1.11 "Condemnation Fraction" shall have the meaning provided in Section 9.1(b). 1.12 "Control" with respect to any Person, including the correlative meanings of the terms "controlled by" and "under common control with" shall mean the possession, directly or indirectly, of the power to direct or cause the direction of the management policies of such person, whether through the ownership of voting securities or partnership or membership interests, by contract or otherwise. 1.13 "Construction Agreements" shall mean agreements for construction, Restoration, Capital Improvement, rehabilitation, alteration, extension or repair performed pursuant to this Lease. 1.14 "Default" shall mean any condition or event, which constitutes or, after the giving of notice or the passage of time or both, would constitute an Event of Default (hereinafter defined). 1.15 "Deficiency" shall have the meaning provided in Section 23.4(c). 1.16 "Depositary" shall mean first any Fee Mortgagee who would qualify as an Institutional Lender, and then any Institutional Mortgagee having an office in ___________. If no Fee Mortgagee or Institutional Mortgagee meeting the aforementioned requirements shall exist, then "Depositary" shall mean any Person (hereinafter defined) who qualifies as an Institutional Lender and who is designated from time to time by Landlord to serve as Depositary pursuant to this Lease. 1.17 "Environmental Law" shall have the meaning provided in Section 26.1(b). 1.18 "Equipment" shall mean any and all fixtures, equipment and machinery of every kind and nature whatsoever now or hereafter affixed or attached to the Buildings, or now or hereafter used or procured for use in connection with the operation, use or occupancy thereof, and the appurtenances thereof, but excluding therefrom all trade fixtures and articles of personal property title to which is vested in the tenants under any leases of space therein or in contractors engaged in maintaining the Premises. 1.19 "Event of Default" shall have the meaning provided in Section 23.1. 1.20 "Expiration Date" shall mean the date of the expiration of the Term as set forth in Article 2. 1.21 "Fee Mortgage" shall mean any mortgage or trust deed which now or hereafter is a lien on the entire fee simple title to the Land or the Premises, or any part thereof, as the same may be renewed, modified, amended, extended, consolidated or coordinated from time to time. 1.22 "Fee Mortgagee" shall mean the holder of a Fee Mortgage, including, without limitation, an Institutional Mortgagee (as hereinafter defined). 1.23 "Governmental Authority (Authorities)" shall mean the United States of America, the State of ___________, County of ________ and City, and any agency, authority, department, commission, board, bureau, instrumentality or political subdivision of any of the foregoing, now existing or hereafter created, having jurisdiction over the Premises or any portion thereof. 1.24 "Hazardous Materials" shall have the meaning provided in Section 26.1(c). 1.25 "Hospital" shall mean ______________ Regional Hospital. 1.26 "Hospital Property" shall mean the parcel of real estate, exclusive of the Land and Buildings, legally described on Exhibit B attached hereto and made a part hereof, together with the improvements located thereon, including the Hospital. 1.27 "Impositions" shall have the meaning provided in Section 4.1. 1.28 "Indemnified Party" shall have the meaning provided in Section 18.1. 1.29 "Institutional Lender" shall mean a savings bank, a savings and loan association, a commercial bank or trust company (whether acting individually or in a fiduciary capacity), a pension or retirement fund, an accredited college or university, an insurance company organized and existing under the laws of the United States or any state thereof, a real estate investment trust existing in compliance with Sections 856 through 860 of the Internal Revenue Code of 1986, as amended, or any combination of Institutional Lenders. 1.30 "Institutional Mortgagee" shall mean an Institutional Lender which is a mortgagee under a Leasehold Mortgage (hereinafter defined) or a Fee Mortgage. 1.31 "Insurance Policies" shall mean any and all insurance policies, which Tenant is required to procure and maintain pursuant to this Lease. 1.32 "Interest Rate" shall mean the corporate rate of interest as announced from time to time by ________ Bank, N.A., or such successor or alternate financial institution as Landlord may reasonably designate, plus two percent (2%), not to exceed the highest rate of interest permitted by law. 1.33 "Land" shall mean the parcel of real estate legally described on Exhibit A attached hereto and made a part hereof. 1.34 "Landlord," on the date as of which this Lease is made, shall mean MEDICAL PROPERTY LANDLORD, INC., a __________________ corporation ("Original Landlord"), but thereafter, "Landlord" shall mean only the holder of the landlord's interest in the Land at the time in question, so that if Original Landlord or any successor to its interest hereunder ceases to have any interest in the Land as the result of a sale or sales or transfer or transfers of the landlord's interest in the Land, then the landlord under this Lease at the time of such sale or sales or transfer or transfers shall be and hereby is entirely freed and relieved of all agreements, covenants and obligations of Landlord hereunder to be performed on or after the date of such sale or transfer, and it shall be deemed and construed without further agreement between the parties or their successors in interest and the Person who then acquires or owns the landlord's interest in the Land, including, without limitation, the purchaser or transferee in any such sale or transfer, that such Person has assumed and agreed to carry out, any and all agreements, covenants and obligations of Landlord hereunder accruing on or after the date of the aforesaid sale or transfer. 1.35 "Lease" shall mean this Ground Lease and all amendments, modifications, extensions and renewals hereof and exhibits attached hereto. 1.36 "Lease Year" shall mean each consecutive 12 month period during the Term, the first Lease Year commencing on the Commencement Date and expiring at midnight of the day preceding the first anniversary of the Commencement Date, and each successive consecutive 12 month period thereafter. 1.37 "Leasehold Mortgage" shall mean a mortgage or deed of trust, including, without limitation, any modification, amendment, spreader, consolidation or renewal thereof, which constitutes a lien on Tenant's interest in this Lease and the leasehold interest created hereby, provided such mortgage is held by (i) an Institutional Lender or its assignee, or (ii) a Person formerly constituting Tenant, if such mortgage is made to such Person in connection with a permitted assignment by it of its interest in the Lease. 1.38 "Leasehold Mortgagee" shall mean the mortgagee under a Leasehold Mortgage, including, without limitation, an Institutional Mortgagee. 1.39 "Liability Insurance" shall have the meaning provided in Section 7.1(a)(ii). 1.40 "Manage" shall have the meaning provided in Section 26.1(d). 1.41 "Medical Campus" shall have the meaning provided in Section 2.1. 1.42 "Net Replacement Cost" shall mean the actual replacement cost of the Buildings (excluding foundation and excavation costs, but including the cost of debris removal and of replacing all Equipment appurtenant to, located in or used in connection with the Building) without physical depreciation. 1.43 "Nondisturbance Agreement" shall have the meaning provided in Section 25.1. 1.44 "Notice" shall have the meaning provided in Section 24.1. 1.45 "Permitted Encumbrances" shall mean the items set forth in Exhibit C attached hereto and made a part hereof. 1.46 "Person" shall mean and include an individual, corporation, partnership, joint venture, estate, trust, unincorporated association or any federal, state, county or municipal government or any bureau, department, authority or agency thereof. 1.47 "Premises" shall have the meaning provided in Article 2. 1.48 "Release" or "Released" shall have the meaning provided in Section 26.1(e). 1.49 "Rental" shall have the meaning provided in Section 3.3. 1.50 "Requirements" shall have the meaning provided in Section 13.1. 1.51 "Response" or "Respond" shall have the meaning provided in Section 26.1(f). 1.52 "Restoration" shall have the meaning provided in Section 8.1. 1.53 "Restoration Funds" shall have the meaning provided in Section 8.2. 1.54 "Restore" shall have the meaning provided in Section 8.1. 1.55 "Significant Portion" shall have the meaning provided in Section 9.1(e). 1.56 "Space Tenant" shall have the meaning provided in Section 10.4. 1.57 "Space Lease" shall have the meaning provided in Section 10.4. 1.58 "Tenant" shall mean AGREEABLE MEDICAL TENANT, INC., a _____________ corporation, provided, however, that whenever this Lease and the leasehold estate hereby created shall be assigned or transferred in accordance with the terms of and in the manner specifically permitted by this Lease, then, from and after the date of such assignment or transfer and until the next permitted assignment or transfer, the term "Tenant" shall mean the permitted assignee or transferee, except that the assignor shall continue to remain liable with respect to any obligations or liabilities of Tenant hereunder which arose or accrued prior to the date of such assignment. 1.59 "Term" shall mean the term of this Lease as set forth in Article 2 hereof. 1.60 "Unavoidable Delays" shall mean delays incurred by Tenant due to strikes, lockouts, acts of God, enemy action, acts of terrorism, civil commotion, governmental restrictions or preemption, fire or other casualty, adverse weather conditions, energy rationing or other causes beyond the reasonable control of Tenant (not including Tenant's insolvency, bankruptcy or financial condition or financial difficulties or problems or any action by Tenant or any Affiliate of Tenant). 1.61 "Zoning Laws" shall mean the zoning laws of the City, as the same may be amended from time to time. 2.1 Landlord does hereby demise and lease to Tenant, and Tenant does hereby lease, hire and take from Landlord, the Land and all necessary easements and appurtenances in Landlord's adjacent land, highways, roads and streets (whether public or private) reasonably required for the installation of utilities and for parking areas, driveways and approaches to and from abutting streets for the use and benefit of the Land (the foregoing being referred to, together with the Buildings which have been conveyed by Landlord to Tenant concurrently with the execution and delivery of this Lease, collectively as the "Premises"), subject to the Permitted Encumbrances. The parties acknowledge that the Premises, together with the Hospital Property, forms a part of a medical campus (the "Medical Campus"). Tenant shall have and hold the Premises for a term of ___ years (the "Term") commencing on ___________ (the "Commencement Date") and expiring at midnight of the day immediately preceding the ___h anniversary of the Commencement Date or on such earlier date upon which this Lease may be terminated as hereinafter provided (the "Expiration Date"). (a) Landlord hereby grants to Tenant a non-exclusive easement, appurtenant to the Land, to use all of those portions of the Hospital Property designated as common areas, parking areas and driveways on the Site Plan attached hereto as Exhibit E, for vehicular and pedestrian ingress/egress and parking purposes during the entire Term of this Lease, for the benefit of Tenant, its invitees, licensees, assigns, subtenants and patrons, in common with all other tenants of the Medical Campus. Landlord shall have the right to locate, relocate, modify, add to or construct any parking areas and driveways or other facilities now or hereafter installed or erected on the Hospital Property and to designate in Landlord's reasonable judgment any such parking areas on the Hospital Property to be reserved for the exclusive use of Landlord and its invitees, licensees, employees, tenants and patrons; provided, however, that no such location, relocation, modification, addition or construction shall unreasonably interfere with or diminish access to the Land provided for in this Lease or otherwise impair the exercise by Tenant of the rights conferred to Tenant. In addition, Landlord shall have the right from time to time to temporarily close or obstruct any portions of such easements if and to the extent necessary to perform maintenance, repair, restoration and excavation thereof or in the case of an emergency. Landlord will take reasonable steps in connection with exercising such rights to minimize any disruption to or interference with Tenant's (or any subtenant's or other occupant's) use of the Premises, and Landlord shall not take any measures which will have a material and adverse impact on access to the Premises without Tenant's consent, which consent shall not be unreasonably withheld, conditioned or delayed. (b) Landlord hereby grants to Tenant non-exclusive easements, appurtenant to the Land, to use portions of the Hospital Property as may reasonably be required now or in the future by Tenant for the installation, maintenance and repair of all utilities, including without limitation, telephone, sewer, detention/retention and other stormwater management facilities, water, gas and electric utilities and related facilities. If any of these utilities are supplied, installed or otherwise controlled by Landlord, Landlord grants Tenant, its successors and assigns, the right to use coupled with its easement, such utilities and related facilities; and Landlord covenants and agrees to maintain the utility lines in good condition and repair for Tenant. (c) Tenant hereby grants to Landlord exclusive easements to use such portions of the Buildings as may be necessary from time to time to install, maintain, display and repair signs, subject to the reasonable approval of Tenant. Tenant covenants that it shall not at any time during the Term install or display or caused to be installed or displayed any signage on the exterior of the Buildings without obtaining the prior written consent of Landlord, which consent shall not be unreasonably withheld, conditioned or delayed. (d) During the Term, and except for Tenant's repair and maintenance obligations with respect to the Premises described in the Lease, Landlord shall maintain, repair and replace, as necessary, or cause to be maintained, repaired and replaced, as necessary, in accordance with standards not less than the standards by which the Medical Campus was maintained as of the Commencement Date, the parking areas, access drives, walkways, bridges, vestibules, landscaped areas, any onsite and off-site retention and detention areas serving the Medical Campus and other common areas improvements in the Medical Campus, if any, including any of the foregoing that may be located on the Land, and Tenant hereby grants to Landlord non-exclusive easements to use portions of the Land and Buildings as may reasonably be required now or in the future by Landlord for the installation, maintenance, repair and replacement of any such parking areas, access drives and retention and detention areas, as well as any telecommunications, security and other facilities to be provided in the Buildings. Landlord will provide reasonable advance notice to Tenant prior to any such installation, maintenance, repairs or replacements and Landlord will take reasonable steps in connection with exercising such rights to minimize any disruption to, or interference with, Tenant's (or any subtenant's or other occupant's) use of the Premises, and Landlord shall not take any measures which will have a material and adverse impact on access to the Premises without Tenant's consent, which consent shall not be unreasonably withheld, conditioned or delayed. (e) During the Term of this Lease, Landlord shall have the right to enact reasonable rules for all tenants concerning the conduct and operation of the common areas, provided the same do not violate this Lease. (f) Notwithstanding the above or anything in this Lease to the contrary, Tenant shall have no obligation (except to pay the Maintenance Expenses) or liability whatsoever in connection with the ownership, maintenance or management of the parking areas, the access drives, walkways, bridges, vestibules, landscaped areas, retention areas and other common areas, if any, involved, including any of the foregoing that may be located on the Land, and that Landlord shall manage, operate, maintain, repair and replace, in accordance with standards not less than the standards by which the common areas were maintained as of the Commencement Date, the parking areas, the access drives, walkways, bridges, vestibules, landscaped areas, retention areas and other common areas or cause such to be done on its behalf, and that Landlord, or its nominee, shall provide and maintain, at its cost and expense, during the Term an insurance policy or policies in accordance with the terms of the Lease and as may be customary for the owners of similar first-class medical office campuses. Landlord will provide reasonable advance notice to Tenant prior to any such installation, maintenance, repairs or replacements and Landlord will take reasonable steps in connection with exercising such rights to minimize any disruption to, or interference with, Tenant's (or any subtenant's or other occupant's) use of the Premises, and Landlord shall not take any measures which will have a material and adverse impact on access to the Premises without Tenant's consent, which consent shall not be unreasonably withheld, conditioned or delayed. (g) Tenant agrees to pay a proportionate share of the Maintenance Expense for the Medical Campus. The "Maintenance Expense" shall be defined to be those costs and expenses paid by Landlord as determined below. The proportionate share shall be determined by taking the ratio of the total area of the Buildings to the total area of all buildings on the Medical Campus (as the same are calculated in accordance with BOMA Standards, including, but not limited to, the Hospital, as the same may be adjusted from time to time. (h) The "Maintenance Expense" shall be limited to Landlord's costs and expenses for the Medical Campus actually paid by Landlord and reasonably and equitably attributable to: (i) the operating, maintaining, repairing, policing and cleaning of the parking areas, access drives and other common areas and common improvements, if any, in the Medical Campus as provided in the preceding Section and (ii) if the Land and the balance of the Medical Campus are separately assessed, the Impositions (exclusive of interest and penalties for late payment) on the land making up the common areas improvements of the Medical Campus. Landlord and Tenant acknowledge and agree that, as of the Commencement Date, Tenant's proportionate share of the Maintenance Expense is _____%. (i) The "Maintenance Expense" shall exclude any and all costs or expenses associated with: (i) any capital improvements including, but not limited to, any costs associated with the renovation or expansion of the Medical Campus, (ii) structural repairs and repairs or replacements made necessary by Landlord's non-compliance with governing codes, by-laws, regulations and ordinances, (iii) remediation of hazardous substances and soil and ground water contamination of any type, (iv) replacement costs of any item to the extent that the depreciation or amortization of any such item has been, or is, reflected in the total costs and expenses of the maintenance, operation and repair of the common areas, (v) depreciation, (vi) interest and principal payments of mortgage and other debts of Landlord, (vii) the cost of repairs or other work to the extent Landlord is reimbursed by insurance or condemnation proceeds or otherwise, (viii) costs incurred in connection with the sale, financing or refinancing of all or any portion of the Medical Campus, (ix) fines, interest and penalties incurred due to the late payment of Maintenance Expenses, (x) organizational expenses associated with the creation and operation of the entity which constitutes Landlord, (xi) payments for rented equipment, the cost of which would constitute a capital expenditure if the equipment were purchased, (xii) costs of correcting violations of law, (xiii) salaries or fringe benefits of (A) employees above the grade of property manager, general manager or facilities manager and (B) employees whose time is not spent directly and solely in the operation of the Medical Campus, provided that if any employee performs services in connection with the Medical Campus and other buildings, costs associated with such employee may be proportionately included in Maintenance Expenses based on the percentage of time such employee spends in connection with the operation, maintenance and management of the Medical Campus, and (xiv) structural repairs or resurfacing of any parking areas or parking decks. (j) Landlord shall deduct in each calendar year from the Maintenance Expenses, any revenues derived from the common areas (such as parking fees), any amounts recovered by it from insurers of damage claims relating to the common areas and any amounts recovered from third parties, other than insurers, on account of any such claims for damages to common areas. (k) As part of the Maintenance Expense, Landlord shall be entitled to charge to Tenant its proportionate share of the actual wages reasonably paid by Landlord to employees and independent contractors in connection with the administration and supervision of the services provided by Landlord pursuant to this Section 2.2. (l) Tenant's proportionate share of the Maintenance Expense for a calendar year shall be paid commencing on the Commencement Date in equal monthly installments on the first day of each calendar month. The amount of Tenant's share of the Maintenance Expense in any given year shall be calculated on the basis of Tenant's proportionate share of the Maintenance Expense actually expended by Landlord during the preceding calendar year as reasonably determined by Landlord. At the conclusion of each calendar year, Landlord shall determine the actual amount of Tenant's proportionate share of the Maintenance Expense for the previous calendar year, based on amounts actually expended by Landlord in the preceding calendar year. Any refund payable to Tenant or any deficiency payable to Landlord for any given year (based on the difference between, on the one hand, the estimated amount of Tenant's proportionate share of the Maintenance Expense and what, on the other hand, should have been paid by Tenant based on the actual amount of Tenant's proportionate share of the Maintenance Expense for said year as calculated by Landlord) shall be made up in the first month after the calculation for the prior year is provided to Tenant. If the Commencement Date is other than the first day of the month, the first such installment and the last such installment shall be further adjusted for the proportionate fraction of the whole month. Tenant shall have the right to review all of Landlord's bills, invoices and records concerning Maintenance Expenses. Any such review shall be conducted at Landlord's offices following not less than ten days prior written notice. Any undercharge or overcharge shall be paid, credited or refunded, as applicable, promptly after such determination. Unless Tenant, by written notice to Landlord, shall take exception to any item in any annual statement of Maintenance Expenses within 180 days after the furnishing of said statement, such statement shall be conclusively binding upon Tenant. Any amount shown by such statement to be due to Landlord whether or not written exception is taken to such statement, shall be paid by Tenant, as provided in this Section 2.2, without prejudice to any such written exception. (m) Tenant hereby grants to Landlord a license to maintain a hospital volunteer's desk at a location in the lobby of the Building that is mutually acceptable to Landlord and Tenant, provided that Landlord continues to man such volunteer's desk on a regular and frequent schedule mutually acceptable to Landlord and Tenant. Landlord shall not be charged any fee for the use of such lobby space. (n) Landlord hereby grants to Tenant a license to use the dumpster or compactor at the Hospital or on the Hospital Property, as the case may be, provided that to the extent Tenant so uses such dumpster or compactor, Tenant shall reimburse Landlord a reasonable proportionate share of such cost, to the extent not previously included in Maintenance Expenses. (o) To the extent Landlord provides security services to the Premises, Landlord shall maintain, repair and replace, as necessary, or cause to be maintained, repaired and replaced, as necessary, all security cameras and related equipment serving the Premises, the Medical Campus and other common area improvements in the Medical Campus, if any, and Tenant hereby grants to Landlord non-exclusive licenses to use portions of the Land and Buildings as may reasonably be required now or in the future by Landlord for the installation, maintenance, repair and replacement of any such security cameras and related equipment. Landlord will provide reasonable advance notice to Tenant prior to any such installation, maintenance, repairs or replacements and Landlord will take reasonable steps in connection with exercising such rights to minimize any disruption to, or interference with, Tenant's (or any subtenant's or other occupant's) use of the Premises. All costs related to such security services shall be included in Maintenance Expenses. (p) Landlord hereby grants to Tenant a license to use the loading dock and loading area at the Hospital or on the Hospital Property, as the case may be, to the extent necessary for the delivery of items to be used at the Premises by Tenant or other occupants of the Premises.